I would like to thank the following musicians for allowing me the privilege of using their music free-of-charge as sound tracks for my videos. Transcript to Austory Dogs Of War. 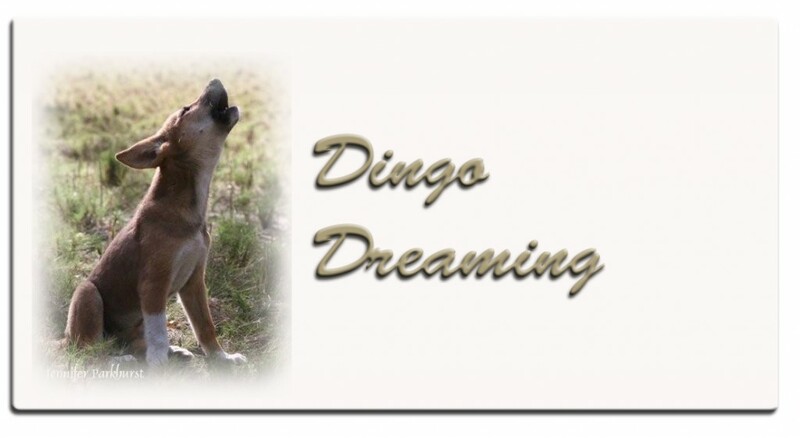 Thank you so much for you wonderful film on dingos and thank you to share it with us. I was so sad to know that these beautiful and so cut animals have been destroyed. It’s heart breaking for you and all the people who love dingos. Do you allow me to put a tie with your film on facebook? Thank you for sharing the video. It is heartbreaking to watch and at the same time inspiring – I do not know anyone who has had such a close connection with wild dingoes. I sent it to Deborah Rose and Adam Geiger who makes wildlife documentaries. Very moving story and you must have been guttered when you found out they were destroyed. I shed a bit of a tear as their intellect even as pups on their own, was nothing short of astounding. (Even went outside and gave my doberwoman a big cuddle). I hope you raise as much awareness as you require – and then some; as they are a fantastic animal and man should learn to live with them and not the other way around. We can do something though. Give up 30 minutes each day to write a letter – your local paper, your city paper, your TV and radio Stations. The Queensland MPs The qld Environmental Department, Ecosure enquiry. The Queensland University ecology and biodiversity department. We don’t have to picket Fraser island we can bombard MPs and media. I have heard stories from the past- fishermen used to gut their catch and throw to the Dingoes lined up on the sand. Dingoes romed the dumps, ate the afterbirt from the brumbies. There were even signs encouraging people to leave their food waste in the bush for the Dingo to clean up. We’ve learned so much!!! One solution I like is for rangers to establish feeding stations in a remote area and have tourists pay to go on a ranger conducted tour to watch them behaving naturally. If there was food left for them, they would be less inclined to hang around holiday houses for a toast crust. Tourism numbers MUST be limited. Tourists have to pay for a permit to visit the island. (like $50-100). The owners of holiday homes pay a grand a year to use them – all money to help the dingoes. of course take the guns OFF the rangers. Prosecute hoons belting along the sand have huge fines for people going within 10 feet of a dingo. Different if they come and sit near you. Huge fines for feeding because they won’t need it – the rangers will be feeding them. Declare the FI Dingo endangered. A new government can start a new culture. Anyone want to copy any part of this to use in a letter, please feel free. Find the on line pettition and sign it. Join Save the Fraser Island Dingoes Inc. Lectures and films like this one shown at the resort. I also think Jennifer is very courageous, and has been treated appallingly by the system. Some say that personification and human emotions are not to be amplified and/or paralleled to animal charectistics and that human laws should be upheld and not countered by ‘fuzzy’ sympathetic human emotions, where empathy should be displayed and an unbias even handed account recorded of the situation and acted upon by an unbias party and action deliberated upon, however, if this be the case human laws should be upheld and evenly handed for all offenders involved. this was not the case as a bias was held against jennifer. for not the same rules applied to both the prosecuted, for the same ‘illegal’ activities, this is known as an injustice. although dingoes are not human, as Australian native animal should have parreled conservations rights to ALL other native wildlife this ‘rule’ was also breached by the rivals of jennifers article who were ‘offended’ by her critiscism due to the lack of care for the dingoes, in this circumstance often retorted their opions and judgements during her trial. So who did jennifer lose the case too? the government and its laws, or did she lose the battle to a hierachy of power influenced by wildlife services and rangers who did hold reason for bias? I have just watched the ABC -Australian Story about the Dingo’s of Fraser Island. If money is involved you can be sure the outcome will be at the cost of the innocent – in this case the Dingo. Fraser Island inhabitants the most purest Dingo alive today should be protected what ever the cost. WHERE IS THE JUSTICE FOR THE DINGO? THIS IS ONE OF GOD’S CREATURES TOO! Jennifer, I just watched your plight on Australian Story (must have been a repeat) and how I felt for you and the dingoes. Shooting any animal is cruel let alone a starving one, my God, how dare they, heartless creeps. You are very brave and care for life. You were doing nothing wrong in God’s eyes. Compassion is your only ‘crime’. In this greedy world, seems only money is king. Tourists make money for the island, bugar living things. Any one gets killed, well they should take responsibility for themselves. Dingoes are wild animals but some humans are so stupid they don’t get out of their way for their own safety. How dare they prosecute you, what, for being a kind person. This world is back to front ! God bless you, stay strong. after seeing the Australian Story on Television, it is obvious to me that there is more to qpw and derm that shows on the surface, it is obvious from the comments that they are still not answering the questions. Who are these people who seem to be a law unto themselves. I also deplore the verdict given by the Magistrate,this was over the top. I am disgusted with the whole system. and from the comments so are a lot of people. Congratulations to Jennifer Parkhurst and to Australian Story for running this sad story. I wish there was something I could do to help, but can’t really think of anything. Is there a petition I could sign? I have now, after some searching, found a website through Facebook. Those poor starving dingoes on Fraser Island – I couldn’t see such poor starved creatures without wishing to feed them. I totally understand why Jennifer did so. One point that was not made very clearly during the story was the connection between the dingoes starving and the two dingo attacks that were reported on in the programme. Clearly, a starving dingo would be much more likely to attack a person than a well-fed one! I am not wishing to trivialize the dingo attacks – obviously, they were extremely sad and unfortunate. But what about the context of those attacks? Why were these dingoes starving in the first place – what had happened to their usual food supply? Why was there no management plan in place for their preservation? And how could those cruel tags which OBVIOUSLY interfered with their hearing – causing the ear to droop with the weight of the tag – ever have been contemplated? A dog which can’t hear properly is clearly unable to hunt. Why was the RSPCA and other groups not up in arms about this? Like Shelley who posted the comment above, I too used to know Bruce Jacobs and his work with dingoes in Victoria. Who is carrying on this work, I wonder? The existing ‘managers’ have failed in their duty to preserve the Fraser Island dingoes – they should be held accountable for that. Their only role seemed to be to shoot the starving dingoes – hardly a great management strategy! As for poor Jennifer and the ridiculously high fine of $40,000 for feeding the dingoes, I do hope that there is a kind-hearted lawyer who is prepared to do some pro-bono work to appeal against that fine. Nevertheless, I think Jennifer is very courageous in coming forward and allowing the rest of us to understand the sad story of her and the dingoes she loves. Thank you. there are only 16 dingoes with collars left – two have been run over. It touches the soul of every body its what we all stand for the life of the dingo .We all can do something no mtter how small it all goes to help .god knows i will keep on doing what i do﻿ best and that is care for our wildlife and country . Keep up the great work Jen we are all beside you . Yes it is a real shame how this animal has been demonised; honestly, the way these dingoes are treated it is﻿ surprising that they are not running around the island attacking people whenever they get the chance. but they are in reality a gentle, sensitive animal that take all the undue punishment with dignity and nobility. Wish I could travel there to see the dingoes & other wildlife exclusive to Australia! Yeah, what a “vicious” animal that is in the video. Yes, they’re wild animals, but to hear the horrors described by﻿ the government there, you’d think they’re bloodthirsty, indiscriminate killers – much like US ranchers try to depict the wolf. Obviously, someone has been lying to us…. Andrea Leverington, this is not ” World’s Best Practice “. And now a total of 20 dingoes have been collared, this﻿ is absolutely wrong. What University Ethics committee approved of this diabolical experiment ? Poor Fraser island Dingoes! Please can someone tell me the University Ethics Committee that gave approval for these collars as I wish to contact them regarding the procedures. I have worked﻿ with ethics committees for research programs in the past and cannot believe that proper procedures were followed. what a disgrace, i cannot believe what i am seeing, this is just as cruel as the slaughter of cattle in indonesia.﻿ doesnt any body care? dingoes are extremely sensitive animals. why do people think their family dogs have feelings but wild dingoes dont? dingoes would hate being collared. leave the poor bloody things alone and let them get on with their lives. how can this be considered valid research? the dingoes would not be acting normally, no chance. Humans are everywhere, why can’t we just stay the heck out of their land out of their territory, out of their island. All humans should just get OFF THE ISLAND and leave them alone. HUMANS are a PLAGUE. This is a disgrace. And﻿ any tourist who goes here should be ashamed, as THEY are the problem. Just leave them alone. I am sick of the human speciests that I have to share this planet with. And the dingoes are sick of it too. Dam humans who think they can dominate every inch of the planet! I am so SICK of the human speciests in this world. Dingos have feelings too. All People should just GET OFF THE ISLAND and leave the dingos alone. So sad that the Dingo is going to die out. Humans﻿ are a disgrace to animals. I wish Steve Irwin was still alive. HUMANS SHOULD BE ASHAMED OF THEMSELVES !!!!!!!!!!!!!!! These poor innocent wild dogs are being forced to wear these heavy devises, why don’t the authorities who came up with the idea of these intrusive uncomfortable gigantic devises, try wearing the same weight around their necks for 8 months!!! Shame on those﻿ Australians. We don’t want the animals killed, but expect more thought to go into the tracking of them. Gail Browning. From this we can see how much they enjoy life why don’t we allow them to be free of ear tags, hazing,﻿ collaring, starvation etc!! Well I﻿ wish I had a backyard like that. Now if all people just sat back on the sand when the dingoes came around, they would all be able to witness this beautiful family behaviour. Sadly. now because the Rangers on Fraser Island are attacking every dingo they see on the beach and trying to keep them off from 5am to 5pm ( as if dingoes wear watches, strewth ) the general public will not be able to witness dingoes at play. This is the most beautiful footage I have ever seen of the Fraser Island Dingo. It excites me everytime I watch it. Jennifer, I want you to know you are a very special person and this remaining footage won’t be disappearing it is now in the hands of many people in﻿ Australia and overseas. It makes one wonder if this is a “management” program for the survival of the Fraser Island Dingo or a long term eradication program. they are so gorgeous! Thank you so much for sharing﻿ and helping people understand these animals need help! Parks & Wildlife need to﻿ be made accountable for this crime. If it wasn’t for Jennifer Parkhurst”s brilliance that she has captured on camera, The world would never know the TRUTH about what is happening to our pure line Fraser Island Dingo. amazing footage!!! This should be used by﻿ Parks and Wildlife as a demonstration to visitors to the Island how exactly to behave!!! could save lives, both the human and the dingoes!!! Yeah it would be a bit scary to see 5 dingoes running towards you, so you can see why people run and scream to get away. But with proper education about dingo puppy play behavior all the tourists would be better off. If only DERM would understand about dingo behavior and tell the Tourists the truth there would be none of these so called ” incidence reports ” against the dingo thereby causing it to be shot by the Rangers. Better Education is the answer. Dingoes have﻿ always been people curious. Excellent demonstration of juvenile Dingo play and pure curiosity. The girl filming did a great job of explaining what was happening and how﻿ to behave around Dingoes. If she wasn’t there the guy would have probably gone home from his holiday and told his mates how he was nearly eaten by a “viscious pack” of Dingoes and they would have been destroyed. Thankfully there is now one more person on the planet that had a wonderful Dingo experience.. This is one of the reasons why the dingo is being shot? Because their natural behaviour makes a human feel threatened? love this﻿ music, it resonates something very deep inside. I hope this is approved and sent to all Back packer Hostels and CTO’s asap. It touches the soul of every body its what we all stand for the life of the dingo .We all can do something no mtter how small it all goes to help .god knows i will keep on doing what i do best and that is care for our wildlife and country . Keep up the great work Jen we are﻿ all beside you .